The Reserve Bank of New Zealand (RBNZ) kept unchanged the interest rate at 1.75% on its September meeting, matching analysts’ expectations. Officials highlighted that the outlook for the economy was little changed since the last meeting, while downside risks to the growth outlook remain. The Michigan consumer sentiment index was downwardly revised to 100.1 in September from a preliminary reading of 100.8. Nonetheless, the reading was higher than 96.2 in August and beaten 100.0 for only the third time since January of 2004. Concerns about the negative impact of tariffs referred to by nearly one-third of all consumers in September. Since the beginning of October, the NZDUSD currency pair lost more than 1.5% and remains in a bearish phase since late September. On yesterday session, the currency pair dived with a wide range and closed near the low of the day, in addition, managed to close below Tuesday’s low, which suggests a strong bearish momentum. The stochastic is showing a strong bearish momentum and is below the 50 midline. 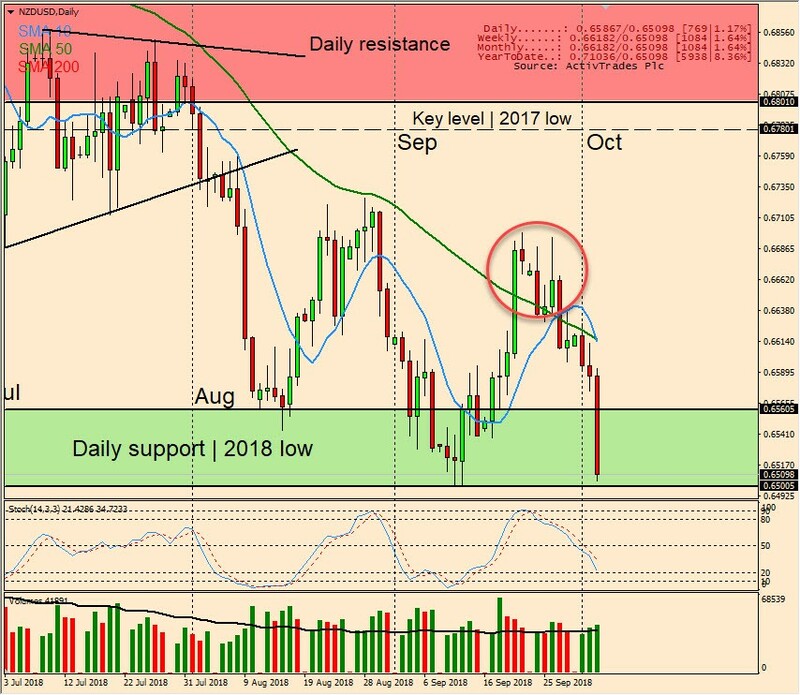 After making a new year-to-date low at 0.6500 in mid-September, the NZDUSD began an upward correction that short-lived as it failed to follow through the 50-day moving average. Now, the currency pair is approaching the year-to-date-low displaying an anomaly, originated by a wide body with a low volume signs of a potential bearish exhaustion.